Agency is the human capacity to make choices and act as an agent by initiating or refraining from individual actions, and it is though agency that an individual engages in the one-on-one interactions that comprise the social structure. 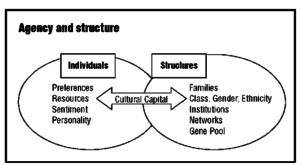 Social systems are therefore comprised of the collective outcomes of individuals exerting agency (Bandura 2001). From a philosophical standpoint, agency is different from ‘free-will’, and this is a central theme in a long-standing debate surrounding the relationship between structure and agency. To what extent are individual choices shaped by structural forces? From a structuralist perspective, individual choice is guided and/or constrained by tangible and intangible forces. Economic barriers such as poverty can limit the number of choices that are available to people. Ideas, norms, customs and values regarding race, class, gender, ethnicity, religion, etc. also inform personal decision-making. Hegemony, for example, limits free choice and ensures that people make decisions that are in accordance with prevailing norms, values and existing social structures. So while agency entails the human capacity to make choices and enact action, the ways that people come to make personal choices are subject to systems of meaning within pre-existing structures. At the same time, structures are dynamic and constantly changing according to individual or collective efforts by people who exert agency to transform existing circumstances and alter their conditions. In the social sciences, Talcott Parsons (1902-1979) was among the first scholars to address voluntary action in what is now known as action theory. In his book, The Structure of Social Action (1937), Parsons addressed social orders as an interaction between macro (structural conditions) and micro (individual voluntarism). By the late 20th century, scholars such as Anthony Giddens, Pierre Bourdieu, and Sherry Ortner aimed to reconcile the dualism between structure and agency. In his book, The Constitution of Society (1984) Anthony Giddens proposed structuration theory which states that structure is both the medium and the outcome of social actions, and individuals can consciously reposition themselves within the social structure through reflexivity. This makes the social and political sciences important, according to Giddens, because social knowledge, as self-knowledge, is emancipatory. 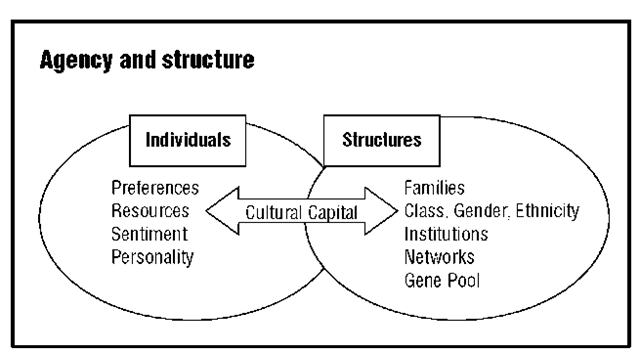 Yet, Pierre Bourdieu produced what is perhaps the most widely used theoretical framework regarding agency and structure within contemporary social sciences. Bourdieu’s approach to agency rests on a theory of practice. We will explore Bourdieu’s An Outline of the Theory of Practice (1972) in greater detail in the next segment. Discussion: Consider the role of agency and structuration in individual action. How is it different from ‘free will’? What are its limitations? To what degree do individuals use free choice and to what extent are we limited by barriers and influences such as hegemony and structure? Are individuals 100% responsible for their actions or do hidden forces play a role in directing human behavior?